Are you looking for amazing, professional carpet cleaning services? Look no further than A & B Chem-Dry! We proudly serve the folks of Raleigh, Wake County and Durham County, NC and more! You can trust our friendly, well-trained technicians to listen to your concerns and work with you to give you the clean home you've been missing. The look of your carpets is important, and we do our absolute best to get them looking like new. However, we also do more than that! We clean with your health and safety in mind! At A & B Chem-Dry, we don't use harsh soaps or detergents, we use carbonation! The effervescent bubbles lift dirt, allergens and bacteria deep from within your carpets and brings them to the surface to be sucked away. Our process uses a fraction of the water and our product, The Natural, is non-toxic, 100% hypoallergenic and on the FDA's G. R. A. S. (Generally Recognized As Safe) list! Our goal is to leave you confident in the way your home looks and feels but also to leave you with a healthier home. 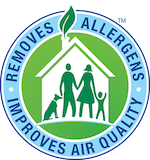 Our added sanitizer and protectant provide additional coverage for your carpets so that they can stay cleaner for much longer! 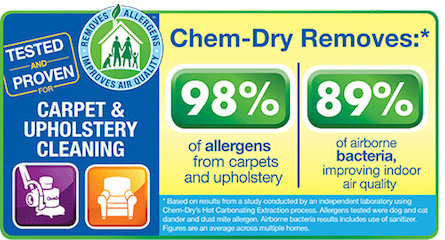 Come experience the Chem-Dry difference with us and we promise you will be amazed and satisfied with our hard work, customer service, and the way your home will feel after it's been given the best carpet cleaning in Raleigh, Cary, Holly Springs and the rest of Wake County and Durham County! I have used this company for seven years. They accommodate almost any schedule or need, are very affordable, and do outstanding service. I would highly recommend them. I have used them for several rental properties and clients and have been happy every time. Their service is prompt and professional. They have been able to get out odors and stains I thought would never come out. I have been using A & B Chem-Dry for over 20 years. Bruce and Fleming have always done an exceptional job! Their service is top-notch and reliable. I will not use anyone else for my carpet cleaning needs! I am a very satisfied customer! You can use these folks with confidence! They arrive on time, are professional and courteous along with doing a great job and a fair price. I have used them several times and not once have I been anything but perfectly satisfied. Looking for amazing carpet cleaning services? A & B Chem-Dry is here! we proudly serve Raleigh, NC!